Using a broody hen to incubate eggs and hatch chicks is of course the most natural way to hatch and has many benefits since she will usually hatch and rear the chicks without needing much assistance. Not all hens will go broody, some are better than others – utility birds will rarely go broody as this has been selectively bred out of them: whilst they are broody, they are not laying eggs. A buff Orpington hen sits on Indian Runner Duck eggs in one of my small broody houses. Hens will usually go broody in the spring and summer months if they are going to go broody at all so if you want to hatch at other times of the year, then you really need to consider using an incubator, be lucky, or artificially light the hens early in the season to start them laying earlier. There is something wonderful about seeing chicks looking out from underneath the mother hen or diving back beneath her for safety and warmth and although I have a great deal of success with incubation, I almost always hatch a sitting of eggs if I have a determined broody. You can use broody hens to incubate eggs and then rear the chicks artificially if you are short on houses and pens for the broody hen and her offspring. Other techniques people use are to use a broody hen to incubate eggs for the first week of incubation (which is the most difficult time) or to use her to rear the chicks you hatch by incubator by placing chicks underneath her at night once she has been sitting for a while. There is no set amount of eggs a hen will lay before she starts to sit. I have had hens lay one or two eggs before going broody and sitting as well as tens of eggs and unfortunately, there is no way of forcing a hen into being broody. It is important to keep the nest boxes clean. Collect hatching eggs as soon as you can after they have been laid so they don’t get soiled or broken by other hens in the house. Eggs can be stored for a week without effecting the hatch rate too much. Longer than this and the hatch rate starts to decline quite rapidly. Collect enough eggs to put under her (this varies between different breeds and between bantams and large fowl). If you are not sure how many she can sit on, put a few too many underneath her, if she can’t manage that many then one or two will come out of the sides over the next 24 hours or so. 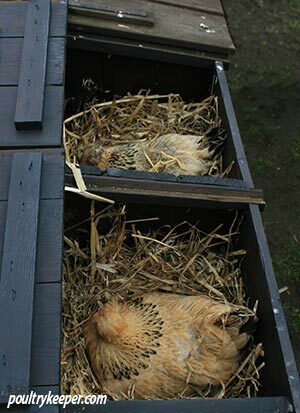 Once one of your hens goes broody and refuses to get out of the nest box, you should settle her into her house at night, away from the other hens. 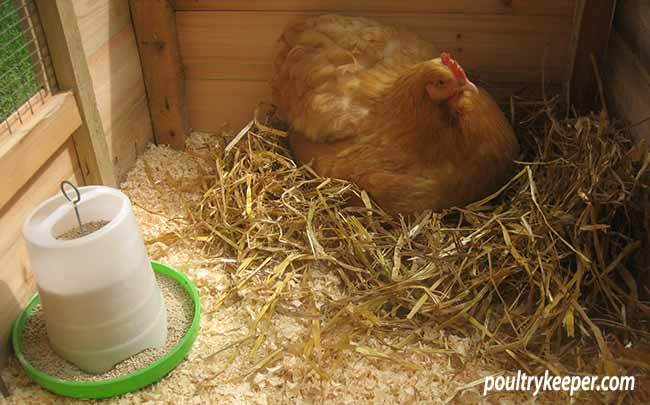 Broody hens are a perfect feast for red mite and can die on the nest if left untreated. Red Mite can kill a broody hen. Before settling her, check for red mite and dust the broody’s nest box under and around the bedding with a red mite powder. Give her a good dusting with a mite / lice powder and keep an eye out for mites while she sits. Other hens will soon peck the chicks when they hatch so it is important to make sure she has her own private house and run. A broody hen-house can be built quite easily if you are handy with a hammer and saw! Give her some dummy eggs or golf balls to sit on so that she sits tight. After another day, if she is sitting well and covering the dummy eggs, you can add your hatching eggs and remove the dummy eggs. The following clip shows me settling a broody bantam into a broody coop to sit on some duck eggs. She had been broody for 3 days beforehand but needed moving from the main chicken house away from the other hens so she could sit. Keen hens do not get off to eat and drink. Some broody hens can even starve themselves to death, it depends on the breed and on the individual hen so it is important that you give her a routine to follow for feeding, drinking and eliminating. You don’t have to worry about keeping the settings of your incubator right or about turning eggs. You don’t have to worry about power-cuts. 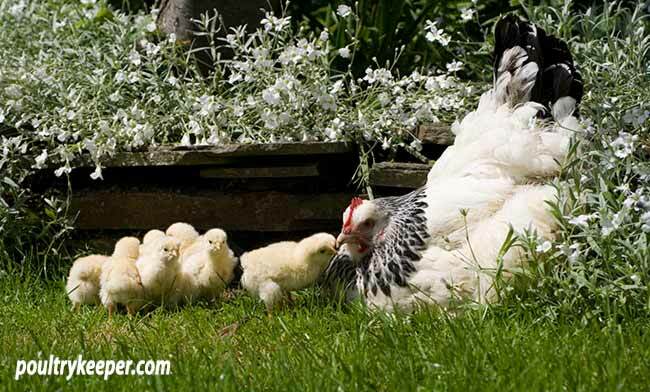 The broody hen will generally hatch more eggs successfully than you will with an incubator. She will raise the chicks, keep them warm and guide them to food. She will usually keep them safe under her. You don’t always have a broody hen when you need one, or hatching eggs for the broody hen when you have one! You cannot hatch as many chicks under a broody hen as you can with an incubator. You need to provide a house and a run for a broody hen for a long period of time during the incubation and rearing process, even if you only hatch one chick. Not all broody hens are good at their job – some will tread on chicks accidentally or even turn on them and peck them, killing them. Incubation with a broody hen certainly has some worthwhile advantages and she usually does a great job of hatching your eggs and raising the young. Most wildfowl enthusiasts swear by them because hatching wildfowl eggs in an incubator is difficult at the best of times and results aren’t usually very good.